In honor of Throwback Thursday I thought I would share a video that the School Wide Positive Behavior Intervention and Support (SWPBIS) team created at my previous school to showcase and explain our SWPBIS Program. I have been thinking about this video a lot lately and I cannot believe I have never shared it with you. The population at our school was K-8 and we involved students in creating and starring in this video. Camp Curtin Elementary PBIS video from Skynine Live on Vimeo. We used this video to do full school refreshers of our program. We showed the video to new students and families to provide them with information about our school behavior expectations. It was a blast making this video with our excellent SWPBIS Team. The husband of one of the teachers I worked who is a professional videographer filmed and edited the video. If you have been a long time reader, you will notice that LaRRRy, our "Leopard Leader Recognition Mascot" makes a few cameos! For more posts about SWPBIS click here. Do you have a SWPBIS program at your school? How do you share the behavior expectations with students and families? I wanted to share another activity that goes along with the welcoming new students theme. All students who are new to my district participate in a new student orientation. They are given a tour and do some icebreaker activities. I wanted to plan a check-in activity for students after they had been at the for month to see how their school year was going so far and if they had any questions now that the school year was up and running. I scheduled three meetings during students study hall period, which is about 40 minutes long. I scheduled a separate check-in for each grade level. I invited all students in the grade who started new to the district since the beginning of the school year. At the check-in, I had students first take a New Student Survey. You can view the survey and the questions I asked here. I created the survey using Google Forms. Since my school is a 1:1 ChromeBook school, students were able to take the survey online. I used the results to see how students were doing and to check-in with students who seemed they could use extra support. After students took the survey, we did an icebreaker activity with M&Ms. 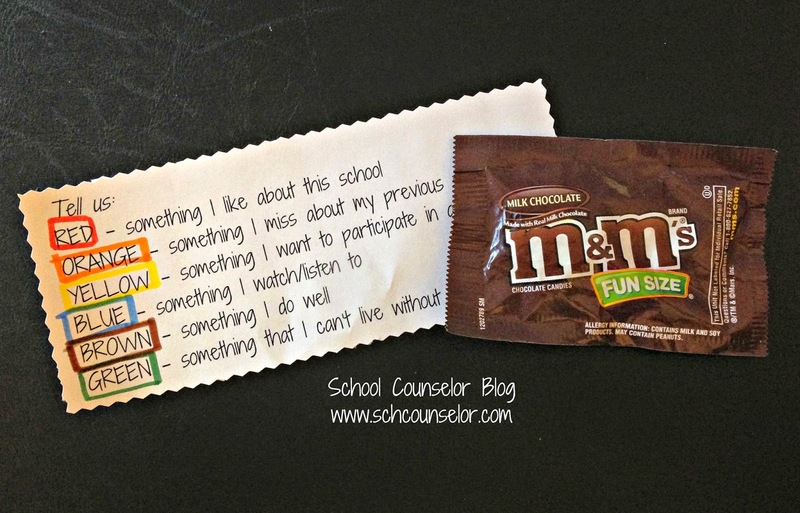 I got the idea for this activity from She's Crafty's M&M get to know you game. I modified the icebreakers to be about new students. I gave each student a fun size pack of M&Ms and the M&M New Student Icebreaker Sheet. We went around the table and students pulled out an M&M to answer the icebreaker that corresponded of the M&M. When students were sharing I asked students to raise their hand if they felt a connection with the person's answer or felt similarly. Overall I think the New Student Check-in went well. It gave new students an opportunity to talk to other new students and to see they were not alone in the ways they were feeling. It helped to answer any questions students still had about the school or getting involved in activities. Although I did not do this activity the same way this year, I did do the components of the activity on a smaller scale. I printed the icebreakers on regular computer paper and used makers to put a box around the colors. I then cut them out with paper edgers to add an element of fun. M&M New Student Check-in - Black and White - this is the version I used and drew around each color with a maker. To modify the questions, go to File, then Make a Copy. Tip: Shop for fun-size M&Ms after holidays! They are a lot cheaper! I have been struggling to juggle the many things that have been going on in my life. Sadly, blogging has been one of the balls that has dropped. I keep wanting to publish a new post, but haven't known where to even start. I have lots of ideas for posts, but I can't seem to get them out of my head and into a post. Today I decided to just go for it... there is no time like the present. I decided to write about welcoming new students because I have had a few new students in the past few weeks. Looking through my drafts I realized that I had started this post last year and never published it. Last school year I wanted to try some creative ways to welcome students who come after the school year has started. I wanted to think of something to help new students feel connected and introduce them to key people in their new school. One of the ideas I came up with was a New Student Scavenger Hunt! 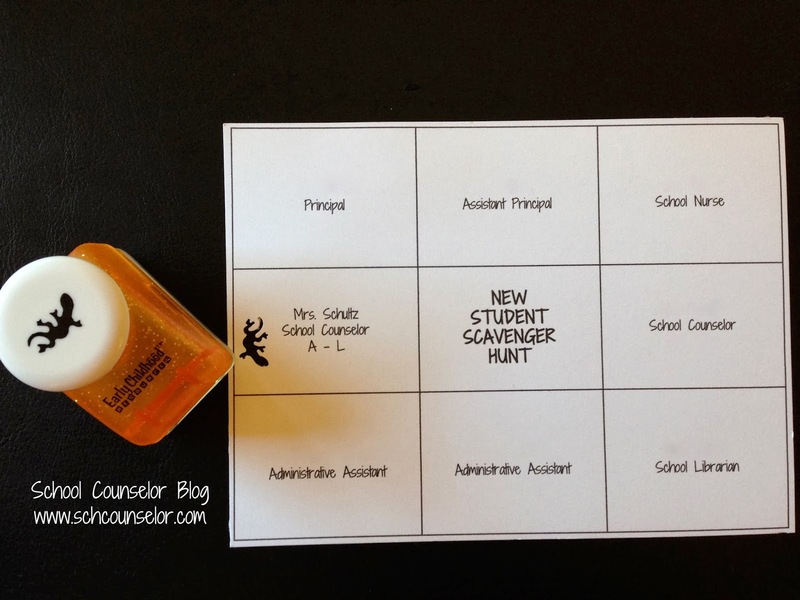 I created the New Student Scavenger Hunt to introduce students to key people in the school. As a new student it can be scary to put yourself out there or to introduce yourself to new people. I thought that by having it be a game with a reward it would motivate students to get out of their comfort zone. I wasn't sure if this was an idea that students in grades 6-8 would buy into, but I decided to give it a try. You never know unless you try, right? Each new student was given a New Student Scavenger Hunt Card with all the key places/people in the school. Students were asked to visit these places in between classes or when they had a study hall period. Students introduced themselves to the key people and then asked him/her to punch their card. Once students' New Student Scavenger Hunt cards were completed, they brought it back to me as a prize. The prize was pretty cool! We ordered printed drawstring backpacks with our school logo to give to the winners. (You could order printed drawstring backpacks from a local screen printing shop or an online retailer like Custom Ink). Before handing out the New Student Scavenger Hunt cards to students, I talked to all the key people students would be visiting and explained the process. I gave them each a paper punch to use to punch their spot on the card. I created a Google Presentation of the New Student Scavenger Hunt Card so that you could edit and add your own school information. Click on the image above for access to the Google Presentation. 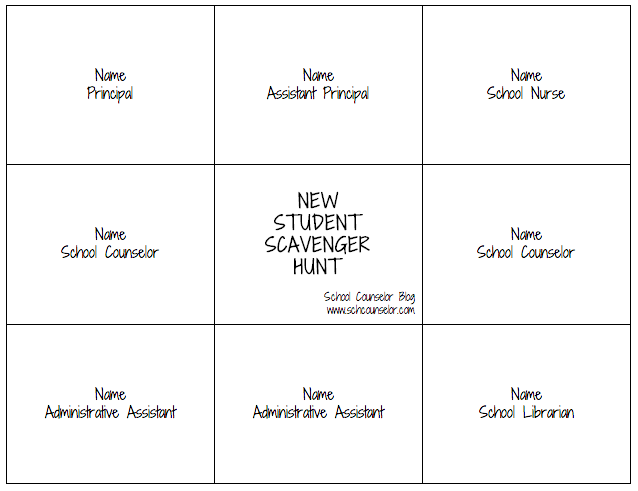 To edit the New Student Scavenger Hunt Card, go to File, then Save a Copy. You will then be able to edit the card and add your own information. I printed the New Student Scavenger Hunt Cards on white cardstock. All in all, I felt the New Student Scavenger Hunt went pretty well. I had way more 6th and 7th graders complete their card than 8th graders. I still gave everyone a logo backpack in the end even if they didn't finish their card. I noted above that next time I do this, I may only gear this towards 6th graders. I think the New Student Scavenger Hunt would be something that elementary students would be really excited about doing. How do you welcome new students who come after the school year starts? February #SCCHAT Transcript: School Counselors Matter! The topic of the the February #SCCHAT was School Counselors Matter. The chat was moderated by Danielle Schultz (me!) (@sch_counselor) Middle School Counselor, Counselor Education doctoral student, and blogger School Counselor Blog. School counselors shared ways that they show stakeholders that their school counseling programs matter, how they show students that they matter, and how they show colleagues that they matter. You can view the transcript below or read the full transcript here. For more information about #SCCHAT and transcripts from previous chats visit: http://bit.ly/scchat-info. 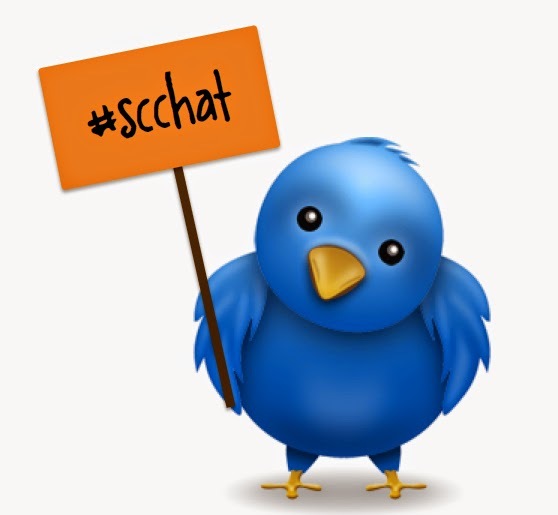 #SCCHAT occurs on the first Tuesday of the month unless otherwise specified. To add the #SCCHAT schedule to your calendar click here. Join us for our March #SCCHAT on March 3, 2014 at 8pmEST. The topic is TBA. Check #SCCHAT schedule for details. Dr. Erin Mason is a former Middle School Counselor, now Counselor Educator who manages SCOPE, a website dedicated to providing school counselors with quality information about using technology in their practice. Connect with Erin via email, follow her on Twitter, add her on LinkedIn or Google+, and become a fan of the SCOPE Facebook Page. Danielle is a K-12 Certified School Counselor, Licensed Professional Counselor, and blogger at School Counselor Blog, a place where school counselors share innovative ideas, creative lesson plans, and quality resources. Connect with Danielle via email, Twitter, Pinterest, LinkedIn, Google+, and become a fan of the School Counselor Blog Facebook Page.